Know what is one strategy that really made a big difference to Alex Mullan's business. Accountability update and a mini-celebration! 2. I mentioned I'd prefer to CREATE than do mundane tasks and reach out to people 1:1. Brad said I needed more content so people get to know me and then come to me…so I started a VLOG this week! 3. Also, met with a girl I know and she's going to be my personal assistant (in person) and help me with emails, newsletters, running errands, tracking etc. We are starting in 2 weeks! Thanks for a great call last week! I’ve invested a lot of time and money in coaching for years, and I’ve gotten more and more choosy about the folks that I choose to work with. When I started working with Brad in 2015, it was because he met my requirements in a coach. First, he has success in his personal and professional life that I admire and I aspire to. This means in our work, he speaks from real experience that I can model and grow from. Second, he invests an incredible amount of time and an incredible amount of emotional energy in the people he works with. The quality of his program, the depth, and the heart (Hart) that is present have delivered a true growth into my life, and we’re only halfway through the program. “I’ve known Brad for a little over two years now, and I am very comfortable saying that he’s one of the smartest, most talented people that I’ve met. I watched him grow two businesses to incredible levels of success, all while continuing to provide his knowledge and experience to help other in the process. I believe that this is why Brad is so successful and will continue to be so in the future. He has the keen analytic skills to assess a new business or situation, apply his intelligence to it, and provide a unique solution that benefits everyone. 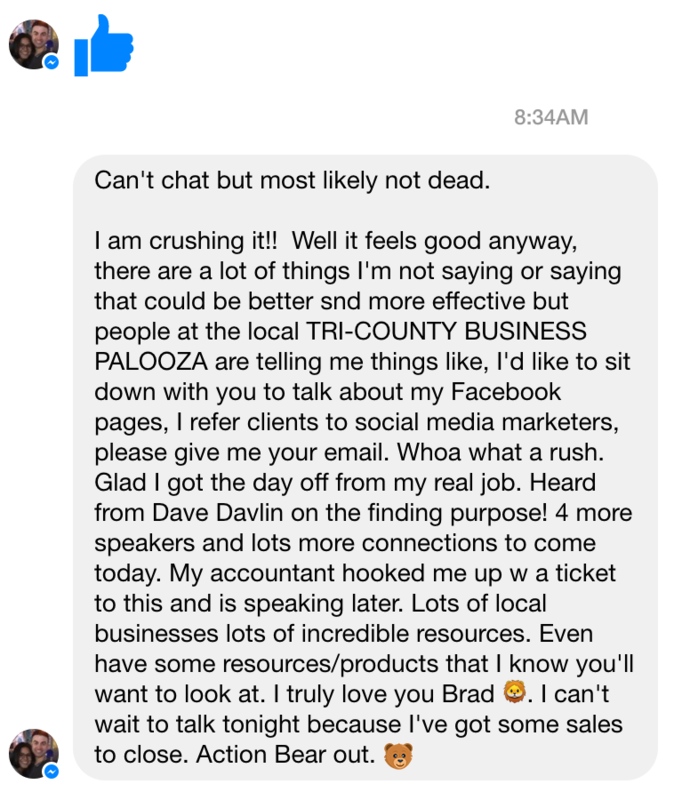 Brad is THE person I would call if I ever needed business advice, or just a sounding board for new ideas! Brad also has a unique approach to wealth building and to teaching this topic to others. I’ve heard him speak about this topic several times, and it still impresses me how he managed to take complex financial topics such as risk management and simplify them to a level that even a child could understand without “dumbing it down” or losing any of the contexts. Brad would be a great person to have at your side, as a mentor, teacher or advisor. “I've been lucky enough to know Brad for a few years, and work with him in the past. As an entrepreneur with ownership in lumber interests and businesses, he is one of those guys you just wish you could hire, but you know you can't because he is already successful on his own. Brad has vision, great ideas, motivation and the skill set to actually act. I'll say that again – he takes things beyond ideas, and does something about them. It's hard to find a do'er anywhere, and Brad is definitely that guy. He gets things done. He has always been generous with his time, and his loyalty to his friends and partners is uncompromising. You'll always know where he stands, and I'd trust him to take my best interests into account without question, regardless of if I was working with him, for him, or learning from him. advise me on financial matters. He assured me that Brad was a true professional, someone I could trust, someone who had his respect as an expert in financial matters. “When I first met Brad I could tell there is something special about him. At the time I didn't know what it was, but now I can tell you– He has true charisma, not the fake act that most people carry, but the genuine appeal of knowing exactly what he wants and how to accomplish it. From the time I have met him, my life has not only improved financially, but spiritually. Brad has taught me more about myself in the two short years I've known him than most will in a lifetime. “Brad is a determined, driven and highly motivated individual. I have personally witnessed his never-give-up attitude as he has developed many positive habits and relationships in his life. His dedication to his business partners has been demonstrated time and time again as he has even moved across the country to help start a new venture with a close associate. Still not sure if you're a marble maker?